I have been on a quest for a homemade veggie patty for… like… ever. I’ve tried a kazillion recipes in the past few years and they are all perfectly yummy but rarely hit highs across the board. Sometimes, they fall apart. Sometimes, they are ingredient heavy. Sometimes the 9yo 10yo won’t come within inches of them. Sometimes they are ONLY yummy if you can serve them with a perfect combination of go-withs. This recipe (originally posted last summer) is still a favorite and we busted it out as soon as we got our first eggplants in the CSA box. They are versatile, freezer-friendly, egg-free, and perhaps most importantly, both kid AND adult approved. Warm 1 tablespoon of olive oil in a large skillet. Add cubed eggplant to skillet and cook over medium heat, stirring occasionally until golden brown and tender. Salt and pepper eggplant to taste. Set eggplant aside to cool. Place cooled eggplant, cheese and bread crumbs in food processor and pulse (6-8 times) till eggplant breaks down to small bits. Note: do not puree or pulverize. Place eggplant mixture in fridge to cool for at least one hour or until ready to cook patties. 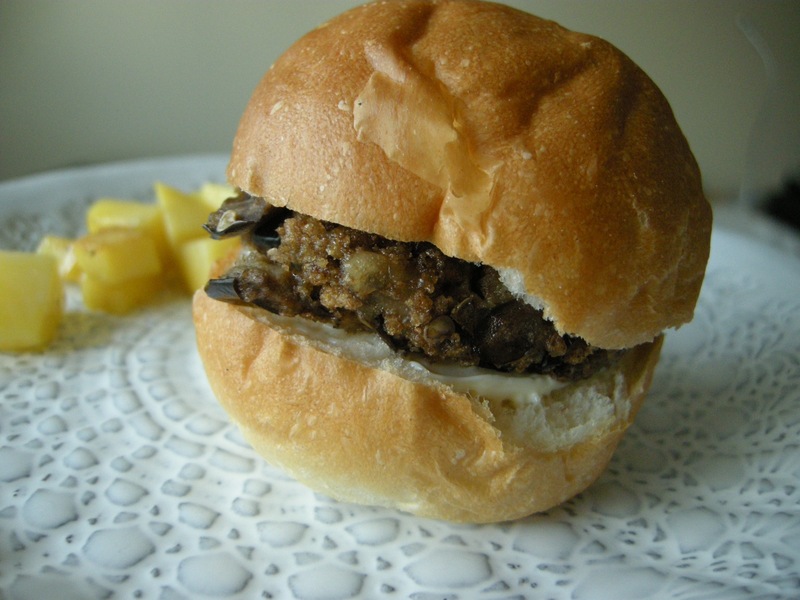 Divide mixture into round balls and form patties (¾ inch – 1 inch thick). Brown on both sides, squishing to desired thickness after first flip. Serve with your favorite burger dressings. If you are freezing portions, make sure to wrap the patties individually to facilitate short-notice dinners and quick weekend lunches. I totally agree with Lauren’s statement. and I love eggplant! I love the simplicity of these! Trying soon.